Nailing concrete has a property of holding nail firmly and it is achieved by including sawdust in concrete as aggregate. Sometimes concrete is required to be nailed to hang or hold something. Nailing concrete allow easy driving of nails. Most low-density (light-weight concrete) concretes facilitates driving of nails but held them loosely. ACI 523.1R has suggested minimum force of held (40 lbs. equivalent to 178 N) when applied as special roofing nail. When sawdust is included in concrete, extensive moisture movement is observed. A rough composition of fresh mix should have equal amount of Portland cement, pine sawdust and sand; water is added to produce a slump of (1~2) inches [25~50 mm]. Now sawdust is an organic materials and organic content always suspected to be decomposed. The sawdust must be cleaned properly and least amount of bark should be ensured to avoid high adverse effect on hydration and setting too. Apart from affect on hydration, it offers reduced moisture movement and rotting of sawdust. Best performances are found with size of sawdust within ¼ in and No. 16 ASTM sieves [i.e. 6.3 mm~1.18 mm] but trail mix is suggested to ensure desired properties as different type of sawdust produce concrete of variable properties for same size of sawdust. Cement and sand are familiar constitutes of concrete and have discussed many posts about these, here we will emphasize on sawdust, the especial constituent of nailing concrete. • Shaving and splinters also suitable to apply in this concrete but suitable chemical treatment is required. Cork granules are also used in this purpose. Other aggregates like expanded slag, perlite, scoria and pumice can also be used. Synthetic materials of organic origin are also applied like expanded polystyrene. Polystyrene is combustible material and required great care in handling. The properties of nailing concrete for different type of materials will discussed later. ACI code provides guidance for low density concrete in ACI 523. 1R where low density is defined as concrete having density in over-dry state ≤ 50 lb/ft3 [800 kg/m3]. This guide can also be applicable in this respect. The compressive strength of such concrete should be in between about 100 to 900 psi. This concrete is also used as thermal insulation. When this is an essential feature of it, code recommended to have low thermal conductivity; should fall below 0.2 Btu/ft2h0F/ft (coefficient of thermal conductivity= 0.3 J/m2S0C/m). When water is ingress into concrete, this conductivity is changed significantly. In case of vermiculite and perlite aggregates, thermal conductivity is found to be increased significantly whereas closed cell polystyrene beads show little change in thermal conductivity. Nailing property of concrete is required for precast unit and sometimes in roof construction. The moisture movement through concrete is a big limitation and this concrete should not be exposed to moisture. Good bonding property allows it to apply to ordinary concrete.Thus they can be used at specific position of nailing. But for insulating property whole member should be constructed of nailing concrete. Sawdust concretes have density ranging from 40 to 100 lb/ft3 [650~1600 kg/m3]. When hardwood is used as sawdust compressive strength of 4500 psi (30 Mpa) and splitting strength of 400 psi can be achieved; the density up to 93 lb/ft3(1490 kg/m3) can be reached. The compressive strength is measured at 28 days and as specimen, cubes are used. 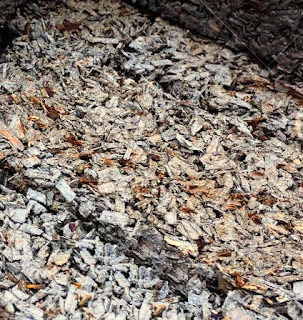 When chemically treated wood wastes are used, the density of (50~75) lb/ft3 can be achieved. But this concrete is suggested no to make as a part of load-bearing concrete member. In case of application of polystyrene, when 700 lb/yd3 (40 kg/m3 ) of cement is used, the density of 35 lb/ft3 ( 550 kg/m3) is achieved having strength 300 psi (2 Mpa).